Beef is the reason I’ll never give up meat. When prepared well, this juicy meat becomes tender, oh-so-succulent, and can even melt in your mouth. 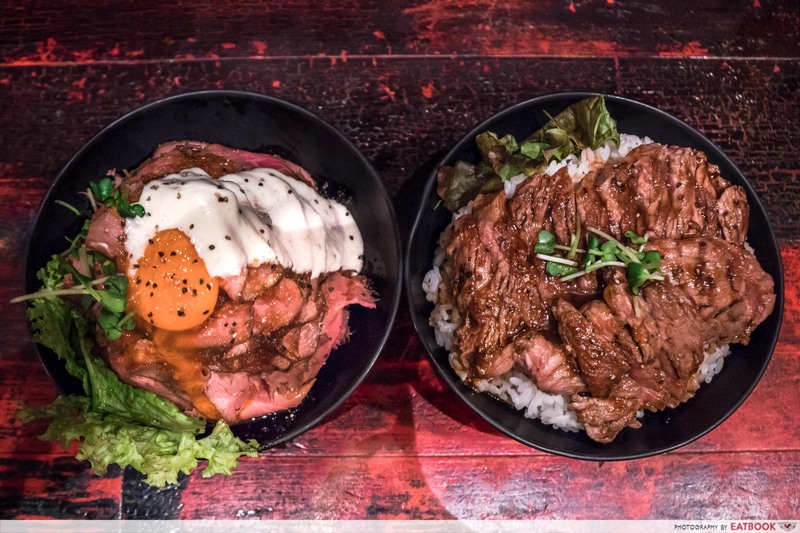 So when I heard about Red Rock, a beef donburi shop in Tokyo that attracts queues even in winter, I knew I had to drop by. 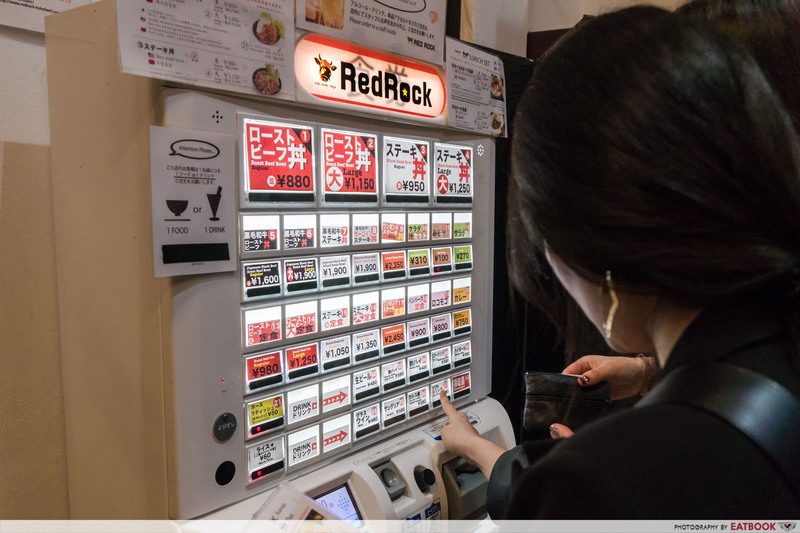 While Red Rock’s beef doesn’t exactly melt, it’s good enough to make me brave the cold winds of Tokyo just for it. 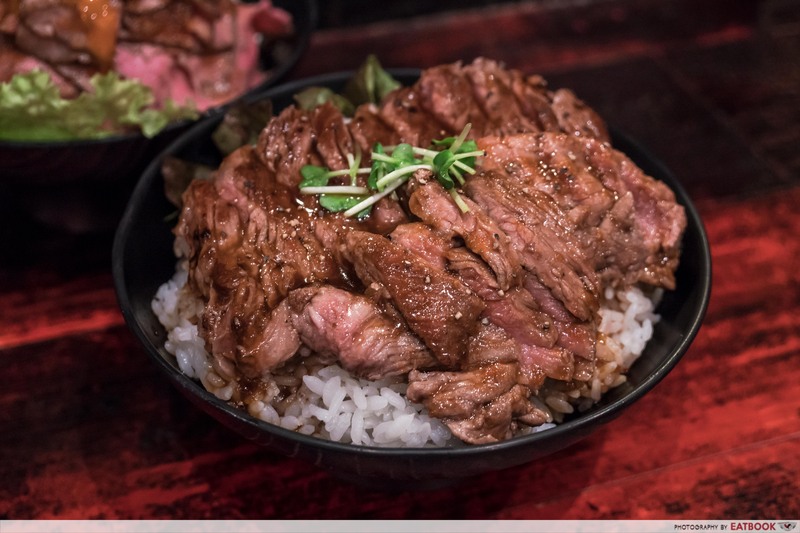 Most people come to Red Rock for this Roast Beef Donburi (880yen/~S$10.74 for small, 1,150yen/~S$14.03 for large). We ordered the large, and got a mountain of roast beef slices sitting atop rice. It also came with a raw egg yolk and some creamy yogurt sauce. 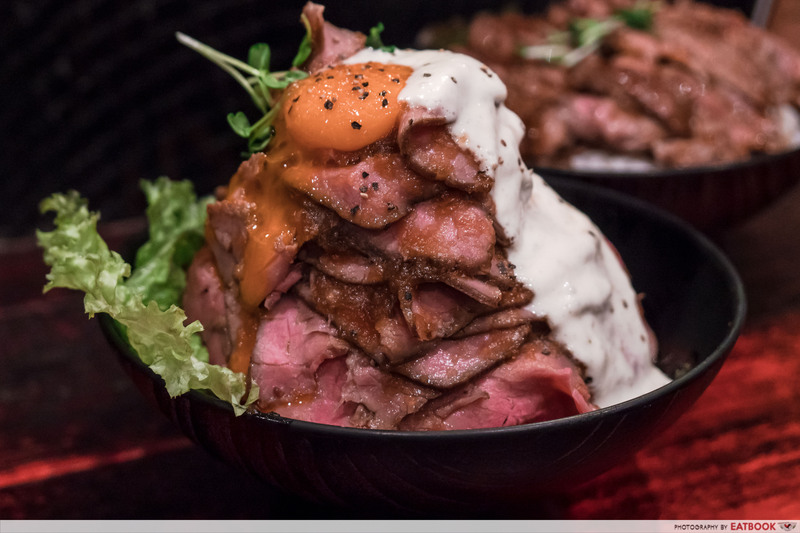 And yes, it is very similar to Gyu Nami’s Wagyu Roast Beef Donburi. There had to be at least 20 slices of lean beef in this dish. Each succulent slice was thin and tasted rather peppery on its own. 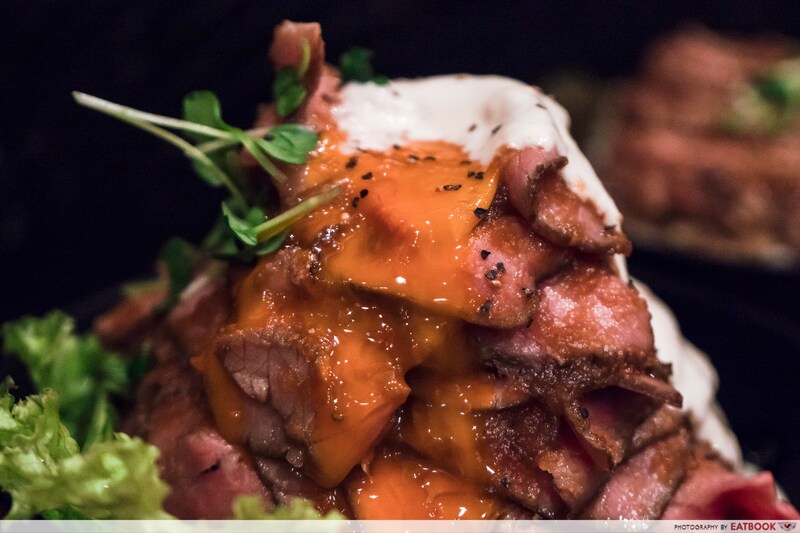 When paired with the tart yogurt sauce, the beef’s taste became more subdued and had a subtle sweetness. Towards the bottom of the beef mountain and just above the rice, was a thin layer of spicy sauce that tasted like Tabasco. 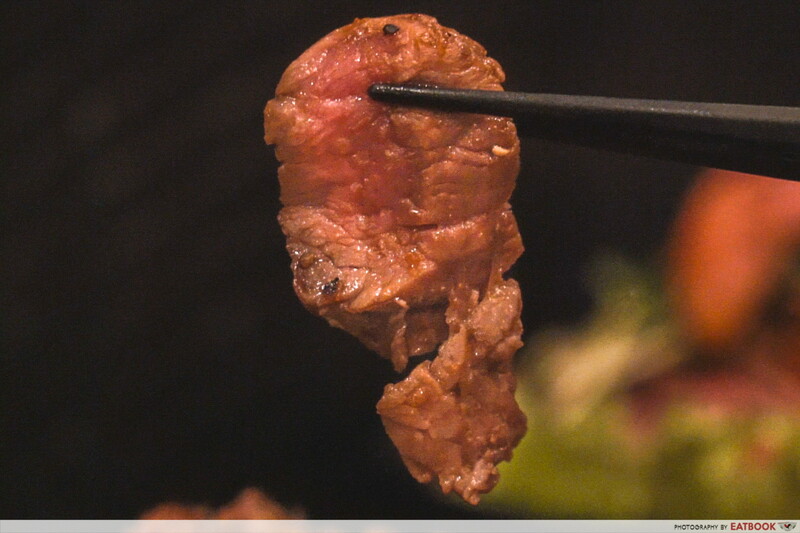 The other must-have here is their Sliced Steak Bowl (950yen/~S$11.59 for small, 1,250yen/~S$15.25 for large). We got the large for this as well, because you just can’t have too much beef. 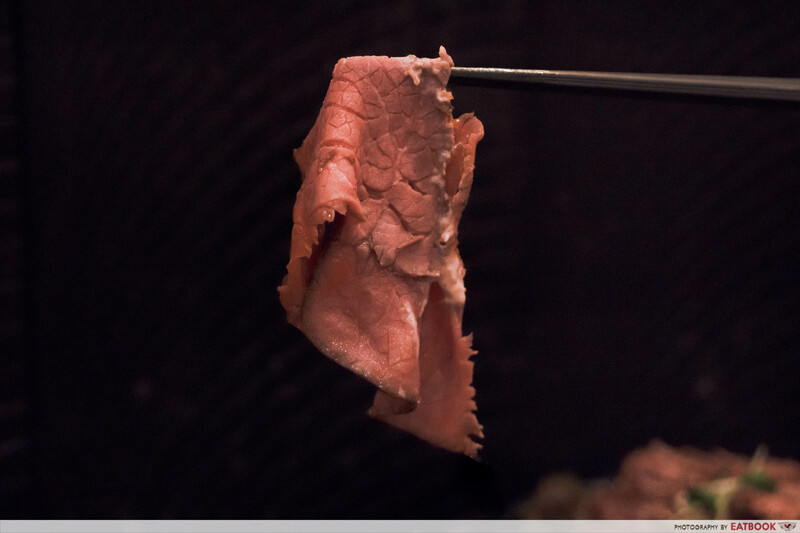 The steak slices were similar in flavour to the roast beef, as they seemed to have used the same marinade. It was, however, juicier and slightly smokier. Unlike the roast beef donburi, this was pretty uniform in taste throughout. The rice was tasty as well, having been touched by the beef’s juices. 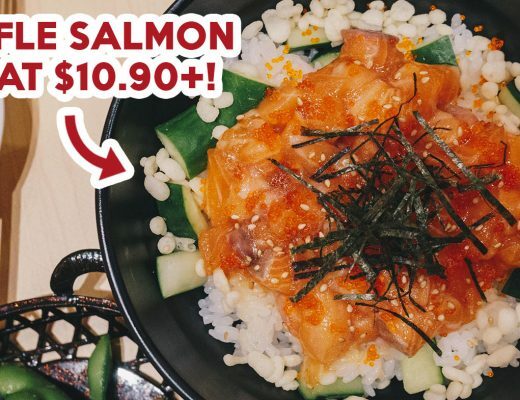 Red Rock has two outlets in Tokyo, and we headed over to the one at Harajuku. The first thing you’ll notice here is the ticket machine outside the door. Before you join the queue, get yourself a ticket. 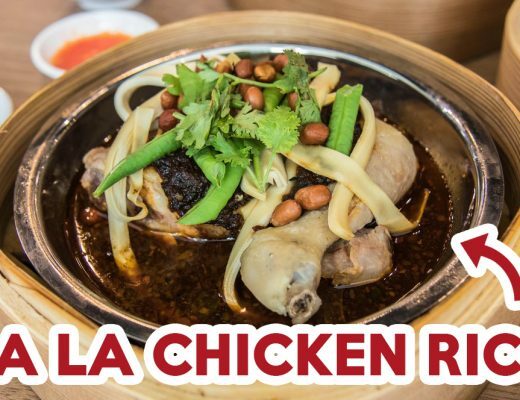 It’s relatively easy to use; just insert cash and pick the dish you want. A ticket will then be issued, and a staff member will collect it before you get seated. There are counter seats as well as regular tables. 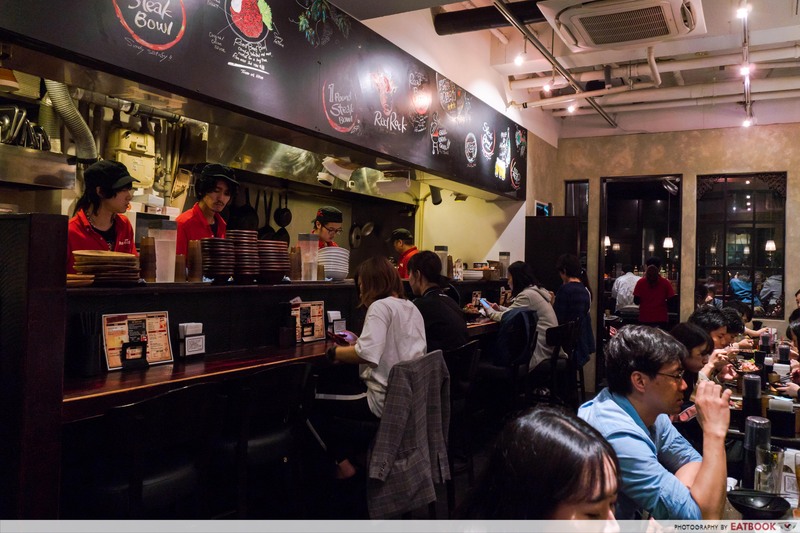 We were shown to the former, which turned out to be front row seats to the spectacular show of the chefs assembling the beef bowls. Drop by at about 5pm like we did; we only queued for about 10 minutes. When we left an hour later, there was a long line of both locals and tourists, waiting to enter. Long story short? Red Rock is worth a visit. 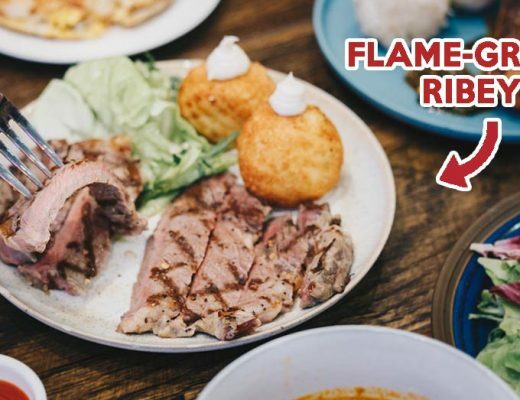 While the dishes were not mind blowing, they were tasty, and it’s almost impossible to get such generous portions of beef at less than $20 in Singapore. You will come out smelling a little like grilled meat, but that’s a small price to pay for the sumptuous meal. Red Rock is not a halal-certified restaurant.